Cool couple alert! 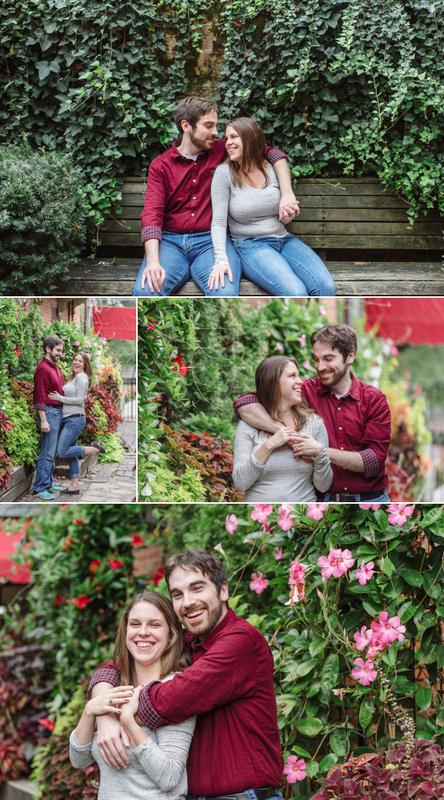 Sean and Amber met me out at Stauff’s in German Village for a laid-back wonderful morning photo session in the fall last year. Sometimes I think it’s fun to just start with coffee and talking. I never drank coffee before I was 35 years old, so lately I find I’ve been making up for lost time and finding any excuse to drink it. Ok, so there are two things that stand out to me about our morning together. One is the way they make each other laugh. It reminds me of me and my husband. I really think one of the deepest bonds you can have is humor. When you can have the humor/love combo, there’s nothing better. And it will get you through quite literally anything in life. It’s a natural high being around them. 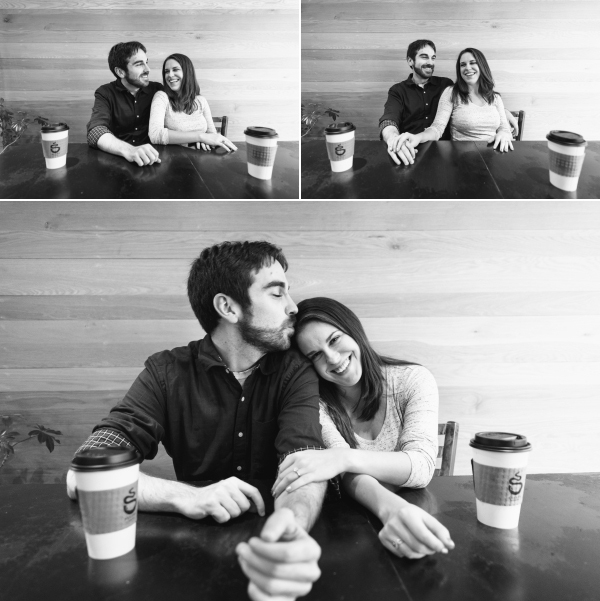 Two, Amber is a taste-tester of chocolate milk and Sean is a self-proclaimed supertaster. I have never met a real-life taste-tester before. It was almost like I was staring at a unicorn. And then Sean informed me of what a supertaster was. It’s actually exactly what you think it is. It’s someone who has super tasting skills. I’m a supertaster when it comes to only a few select things like mustard or beets. Anyways, their amazing sensory abilities are another reason these two are a match made in heaven! This was such a fun little adventure for me! I had only been to Oxford, Ohio one other time for a triathlon and was too tired to even look around when I was there. 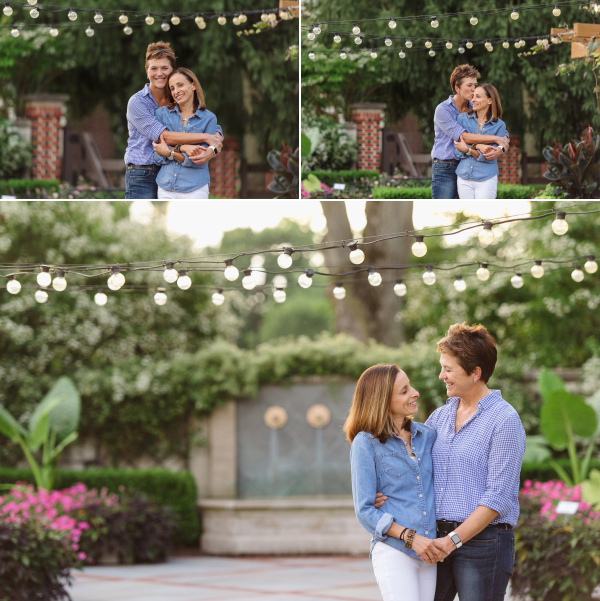 So I was super excited when Tanner told me she had her heart set on having their engagement shoot there. 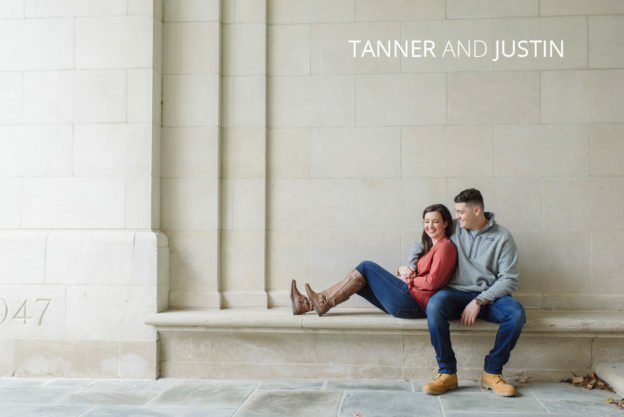 Tanner and Justin met while working at the local Bagel and Deli when they attended Miami University. Naturally, that’s where we started our shoot! 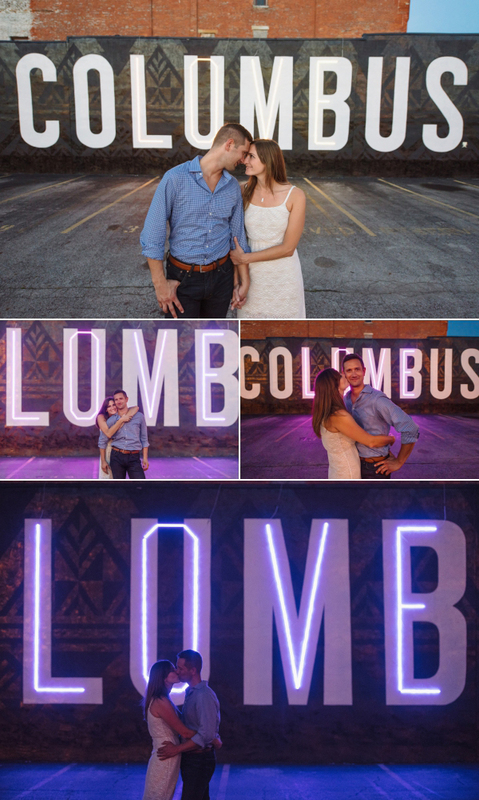 I love the electric neon sign behind the adorable smiles we captured. The weather was just raining enough to create a romantic foggy mist. It made all the colors around us so much more rich and saturated. The brick buildings on Miami’s campus was really impressive. I went to Ohio State which is just a hodgepodge of building designs. On Miami’s campus, it seems as if everything is planned out and cohesive visually. We stopped under the Upham Arch, where according to the Miami folklore, couples who kiss under the arch will get married. 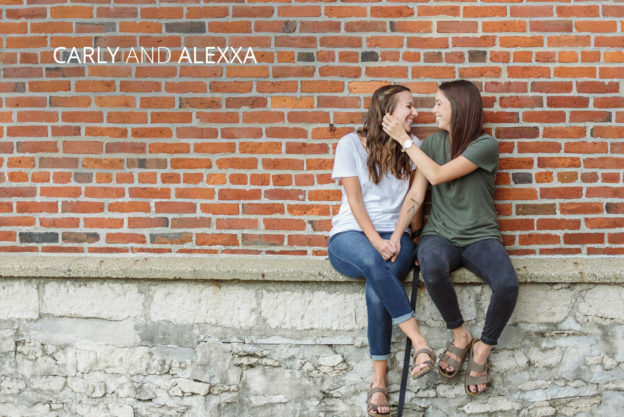 On the Miami website, they refer to this as a “Miami Merger” and the university alumni association sends Valentine’s Day cards to these couples! We walked all over, including this beautiful garden area called the Arthur F. Conrad Formal Garden. 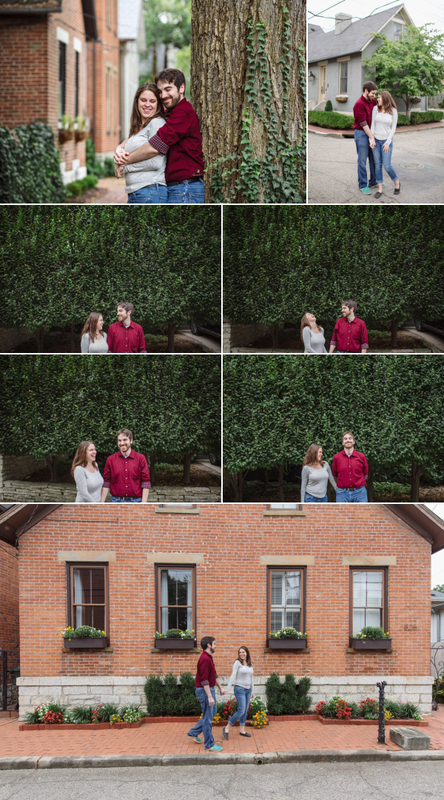 There was a really cool greenhouse we snapped a couple of shots in front of that I loved. It had so much texture and the shots looked killer in black and white. Ok I feel like a part of myself has been missing and this is because I haven’t written a blog in a couple of months. I set the craziest goal for myself this year to do 100 blogs. I am at 50-something, so obviously I didn’t make that goal. But it did train me to write and write regularly. So much so I really missed it when I stopped. I missed sharing all these amazing stories with you. I missed going in-depth visually and sharing all these fun moments we’ve had together. So even though I’m still on the crazy train of editing, I’m making time for a quick blog so I can get my fix. 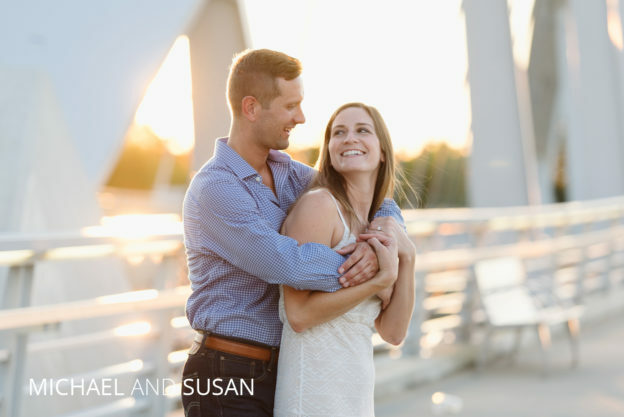 This is Mike and Susan. When I met with them they mentioned they had this special cat that started hanging around them and basically adopted them. 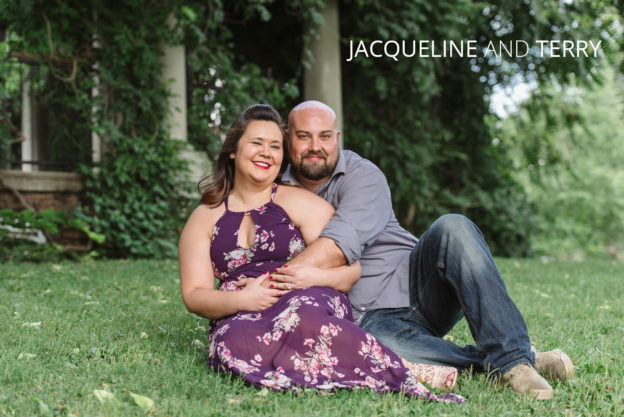 I told them they should bring her to their engagement shoot, and sure enough when I saw them pull up in their truck, there was their cat on their dashboard. I was excited like a little kid. 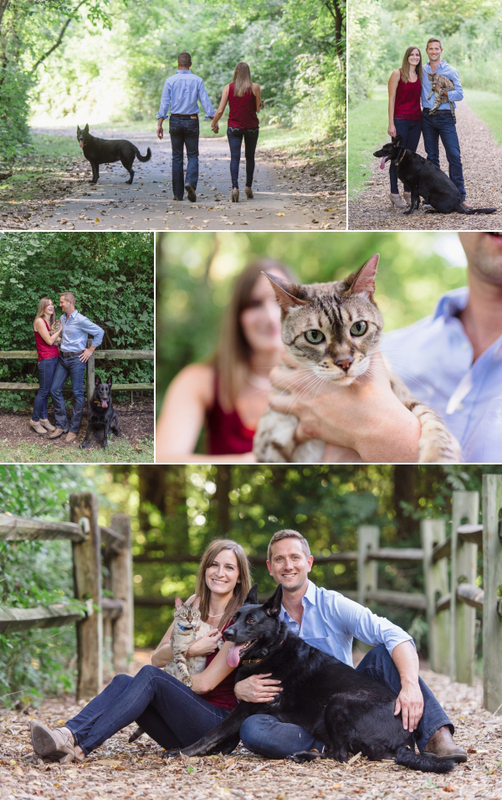 I had never done an engagement shoot with a kitty! This was a very special cat, though. When we did photos of just Mike and Susan, Mike put the cat down to the side and it just waited for them to finish getting their photos taken. It was incredible. They theorized that the cat knows she has it good and wouldn’t dare leave them for life in the streets again. My brother always claimed that cats were super intellectually smart, and this might have proved it to me. I met Traci at a wedding show! I never really do wedding shows, but I was so excited to be asked to be a part of the one at the Nationwide Hotel and Conference Center and I couldn’t refuse. There was only one issue- it was exactly one week before I was supposed to give birth to our daughter! I looked like a beach whale. I was standing on chairs to get my booth set up- I’m sure I made more than one person nervous, lol. In walks Traci, cute as can be. She’s by herself because she came straight from work. We just started talking and I swear just talked and talked for a couple of hours like we had already known each other for years. 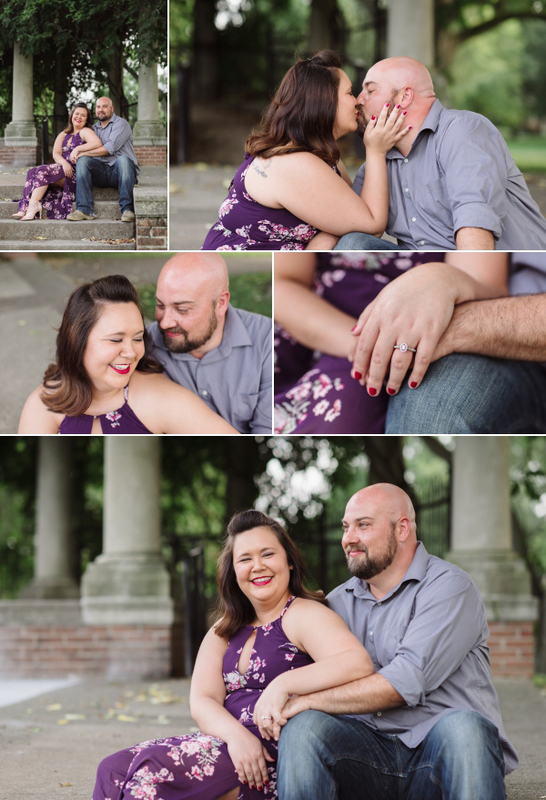 She told me about the love of her life, Andrew, and how much they had already been through together. 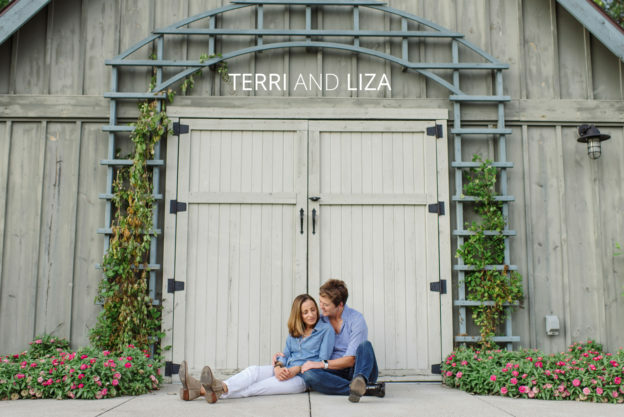 She confessed at the time she wasn’t yet engaged, but she accidentally found the receipt for the ring he bought, so why not start planning the wedding, LOL. 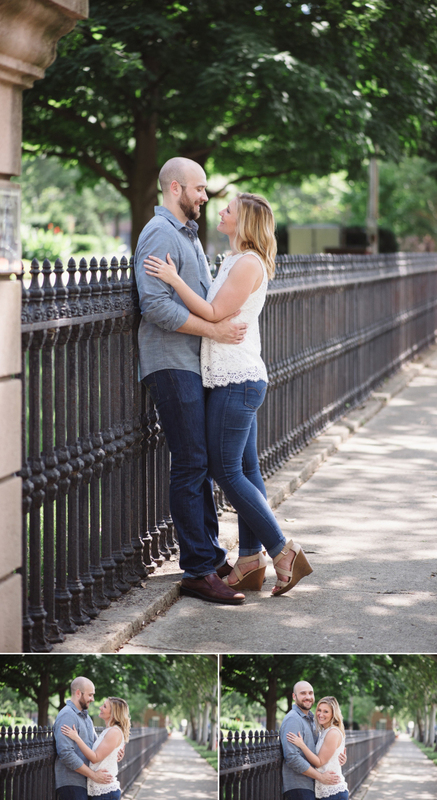 Fast forward to their engagement session date. I was driving to the Audubon center when I got a phone call from her. It was hailing golfball sized hail where they lived and was moving right towards southern Columbus. Needless to say, we decided to reschedule the shoot. And oh my gosh people, the weather on their re-schedule date was amazing. 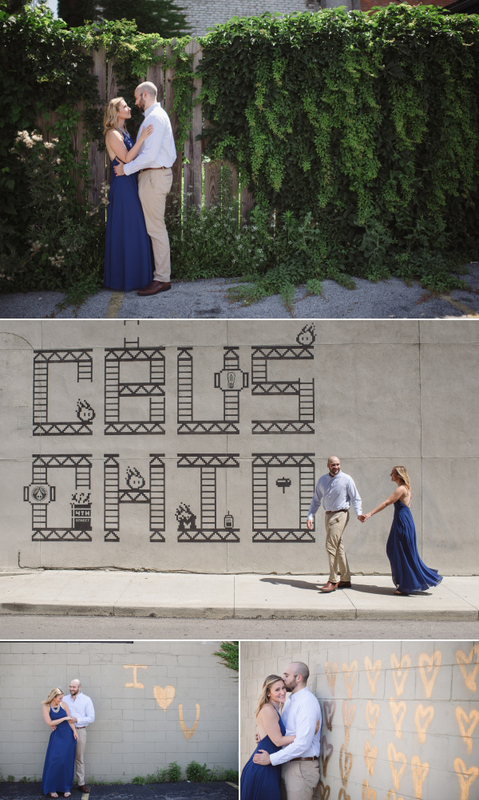 These photos couldn’t be more perfect! 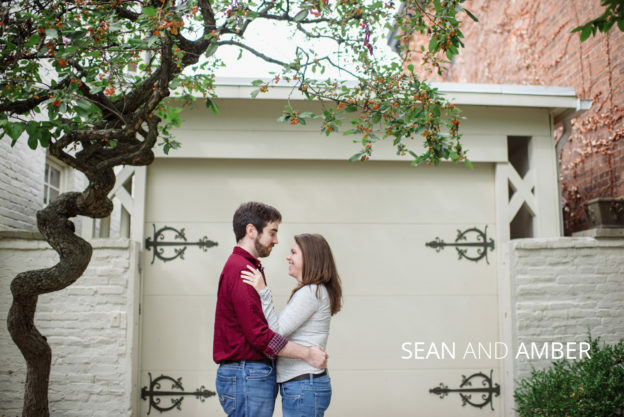 I just had to call a rain date on a couple this past weekend, which I rarely do. But it’s very much worth it sometimes. 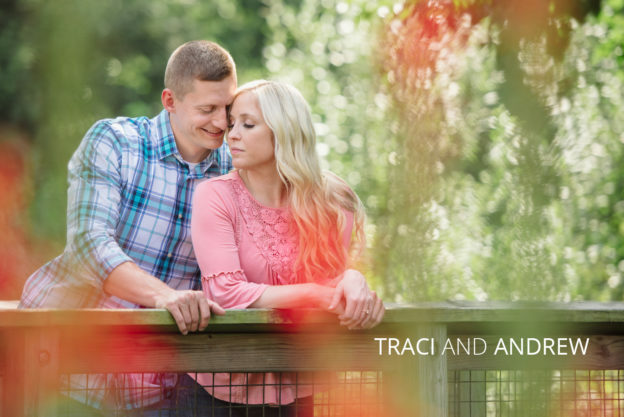 I am so excited for your wedding in a couple of weeks, Traci and Andrew! Getting to know you both has been one of the highlights of my year, so getting to know your family also will be so much fun! 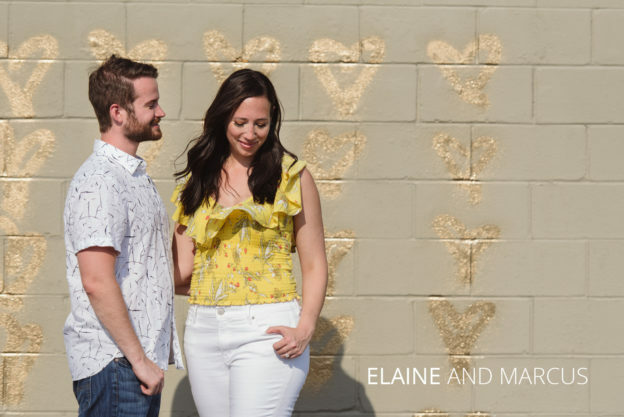 Elaine, Marcus and their adorable mini Goldendoodle, Lola, met me out on a hot summer day last month for a seriously fun engagement shoot. 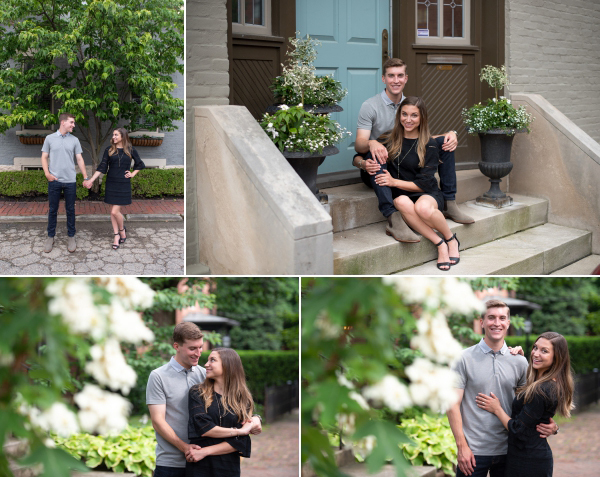 We started the session at the Topiary Park in downtown Columbus and wound our way around the city to all sorts of cool hidden little spots. Lola was with us every step of the way. She got so many hugs and snuggles in the photos. When she wasn’t in the photos, she was supervising from the sidelines making sure mom and dad looked perfect. I left this shoot with a natural high, and not just because it was 90 degrees and I was becoming dizzy. These two are SO MUCH FUN to be around. They are both laid back and have great senses of humor. They are so goofy and don’t take themselves too seriously, which honestly makes for such refreshing photos. Elaine’s pink flowy skirt matched the well-manicured gardens of the topiary park and some of the late-blooming trees in the area. Lola’s tongue matched the skirt perfectly as well, so you can just see how great the color compositions were! 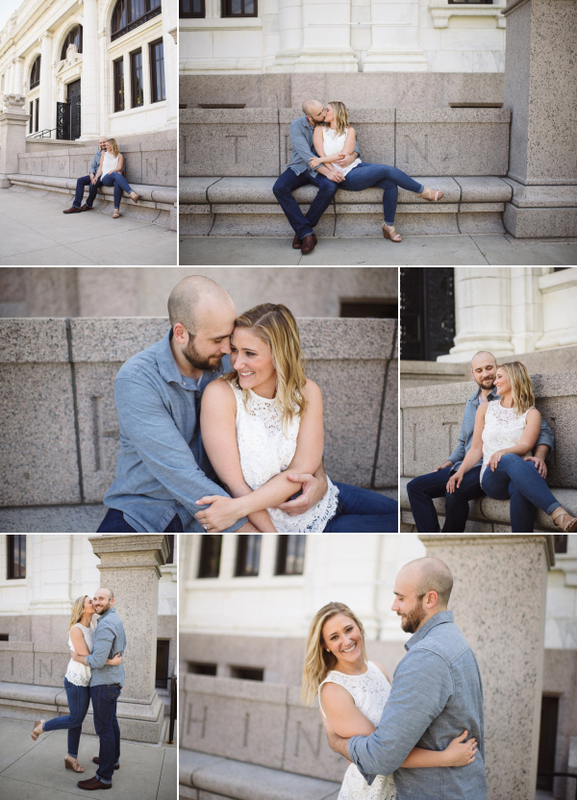 I met Natalie and Mike for the first time on the day of their engagement shoot. They also had their handsome dog Cooper with them. Dogs are the ultimate icebreakers. Cooper acted like he had been waiting his whole life to have his professional photos taken, and he did not disappoint. He fed the camera cute look after cute look and required very little direction- ideal client if you will. 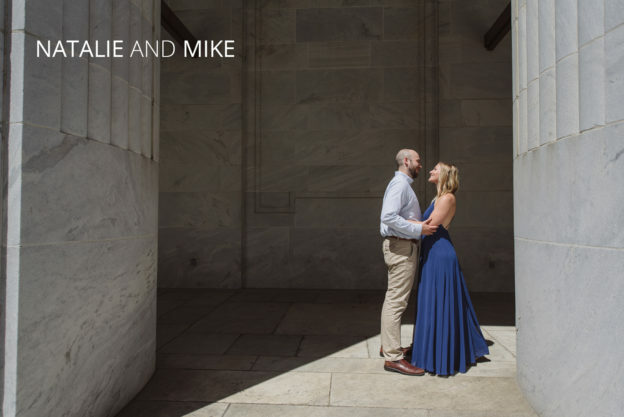 Natalie and Mike were pretty effortless as well. They were so laid back and at-ease. A few minutes into the shoot I felt like I had known them for a lot longer. I adored the story of how they met and keep replaying it in my head ever since I heard it. It’s a story that could be turned into a rom-com script. They both met while grocery shopping at a Whole Foods! They bonded over a discussion on hot sauce. Right then and there they decided to grab a drink together at Whole Foods, hung out into the evening and even kissed goodnight. The rest is history! How cool is that? Such a simple, everyday happening that turned into so much more.